This topic contains 10 replies, has 2 voices, and was last updated by Nayem 3 years, 7 months ago. I'm having a problem with my file uploads. They upload fine but do not appear in the post. Instead it displays a link back to the first ever website post. My other custom fields work fine so I'm not really sure what this issue is. Hi is anyone able to give me some support on this? I have used the sample form to post and did not get any issue. I have pasted the shortcode in a page “test'. Check this screenshot- http://i.imgur.com/78kOVJF.png. The page you have used to paste the shortcode is messed up. Delete the page and create a new page only with the shortcode. I have provided a screenshot to you. It was working for me. You can disable all of your plugin and then switch to a default theme. After that if the problem remains let me know. I've done the test on default theme (twenty fourteen) with all plugins deactivated and I'm still getting the same issue. See the screenshot. Not sure why it's working for you and not me! I have also tried uploading it with only the title field and I'm still getting the same problem. I will check in your site again. Please allow me some time. I have received your mail. I am very glad to know that you have solved the issue. 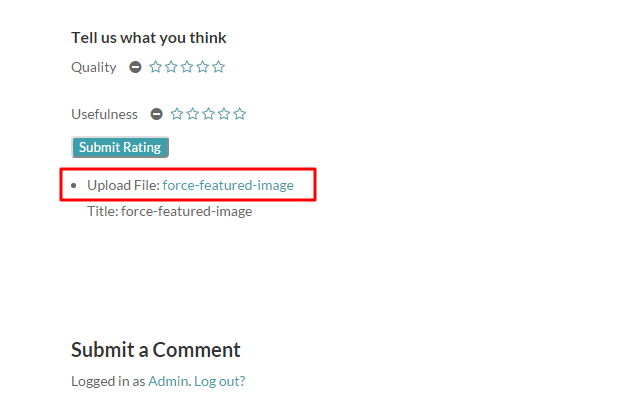 The topic ‘Problem with file uploads display’ is closed to new replies.